On Dec. 4, the bills gutting minimum wage and paid sick leave were passed by the House with some small changes, and then passed again by the Senate and sent to the governor for his signature. The changes to the paid sick leave bill made some small improvements in accrual time (one hour of paid sick leave for every 35 hours worked rather than 40), maximum hours accrued in a year (40 rather than 36), carryover (now allowed) and length of employment required for eligibility (90 days, same as ballot proposal). However, the essential problem with this legislation remains: while the ballot proposal covered ALL full- and part-time workers, the bill sent to the governor continues to exclude the majority of Michigan workers (at least 55% will not be eligible for required paid sick leave under the bill), and employers’ vacation time and PTO policies will put them in compliance as long as they equal the number of hours mandated for sick time under the bill. These two aspects of the legislation gut the spirit and intent of the ballot proposal and make the new legislation unacceptable. The governor signed both bills into law on Dec. 14. 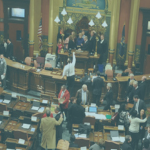 Michigan residents have good reason to be cynical about our democratic process today, as House and Senate leadership continues its tradition of flouting accepted lawmaking practices during the “lame duck” season. Lame duck refers to the period after an election when term-limited, retiring or defeated lawmakers return to office before their successors take their seats. First, fearing that popular ballot initiatives to raise the minimum wage and establish paid sick time would be approved by voters, and thus need a three-fourths majority in each legislative chamber to be changed later, Republicans in September introduced the proposals in their exact form as legislative bills that would need only a simple majority to change. The bills were passed quickly in both chambers and became law. Then, immediately after the election, the same Republicans introduced two bills that weakened the two new laws and set a hearing for those bills for this past Wednesday at 8:15 a.m. And finally, just minutes before Wednesday’s hearing, Republican leadership replaced those bills with substitute bills that hollow out the substance of the minimum wage and paid sick leave laws even further, leaving advocates and the public almost no time to read the bills before the hearing began. (As an advocate, it was frustrating to testify on a bill I had not even had a chance to read—but it was still necessary to speak up!) The full Senate passed the bills that afternoon, with only one Republican voting no. Lame duck shenanigans are not new to this Legislature. Many readers probably remember how so-called “right to work” was rammed through during the 2012 lame duck season with no legislative hearings at all—flouting the long practice of holding hearings, adding amendments and receiving testimony from the public when taking up important and controversial bills. That scenario earned the nickname “shame duck,” as it was clearly a power play designed to thwart opposition and established democratic processes in order to achieve a partisan goal. 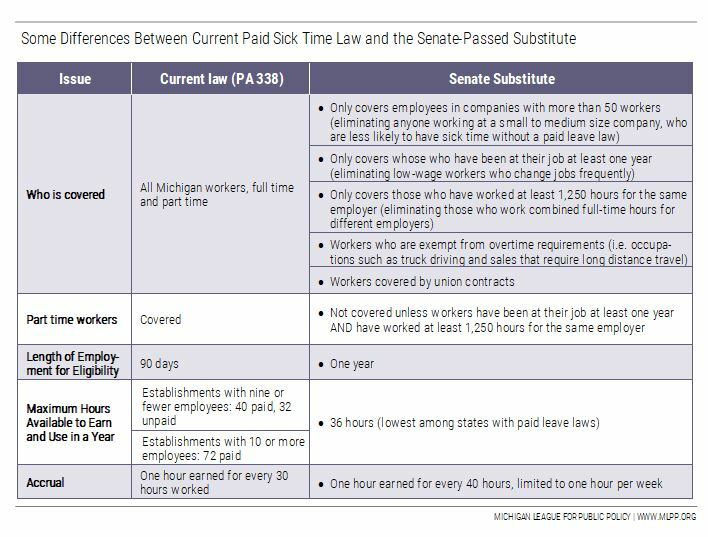 The worst thing about the Senate-passed paid sick leave law is that it excludes nearly 55% of Michigan’s workforce, while current law covers all full- and part-time workers. The Senate also lowered the accrual rate from one hour of sick time for every 30 hours worked to one hour for every 40 hours worked, and lowered the maximum number of earnable sick hours in a year from 72 to only 36. 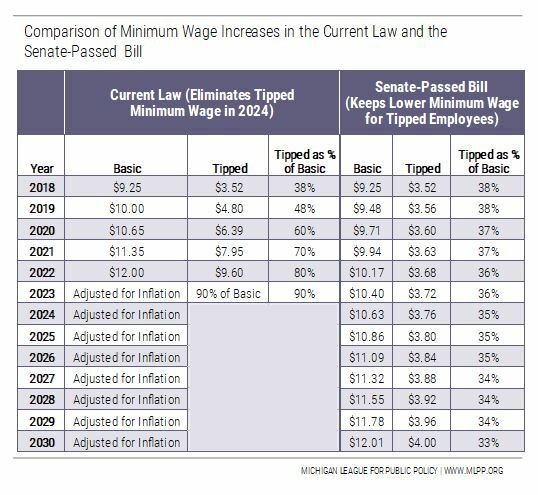 The minimum wage schedule in current law raises the basic minimum wage to $12 by 2022 and it adjusts (raises) it for inflation each year afterward, but the new bill passed by the Senate doesn’t raise the wage to $12 until 2030 and does not adjust for inflation in the years after that. For tipped workers, who receive a lower minimum wage with the idea that the difference between their tipped minimum wage and the basic minimum wage will be made up by tips, the current law phases out the separate tipped minimum wage and by 2024, tipped workers will be under the same minimum wage as all other workers. However, the bill passed by the Senate raises the tipped wage in small increments and does not eliminate it. Because these damaging bills have already passed the Senate, it is likely that they will be rushed through the House as early as Tuesday. It is very important that majority House Republicans hear from their constituents as soon as possible. 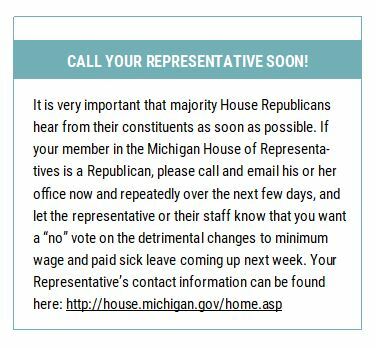 If your member in the Michigan House of Representatives is a Republican, please call and email his or her office now and repeatedly over the next few days, and let the representative or their staff know that you want a “no” vote on the detrimental changes to minimum wage and paid sick leave coming up next week. Your Representative’s contact information can be found here.